Applications are sequenced by the administrator according to Microsoft guidelines. Applications are stored on a network share created by the administrator (SMB, HTTPs). App-V Management and Publishing servers are used to publish applications for a specific AD groups that must by synced manually by the administrator with RAS publishing groups used for App-V application publishing. App-V client is installed and configured manually by the administrator. Package an application using the App-V Sequencer. Deploy the application to an RD Session Host using the App-V Management Console, Microsoft SCCM, etc. Verify that users can launch the application from the RD Session Host. Publish the application from RAS Console (see below for instructions). 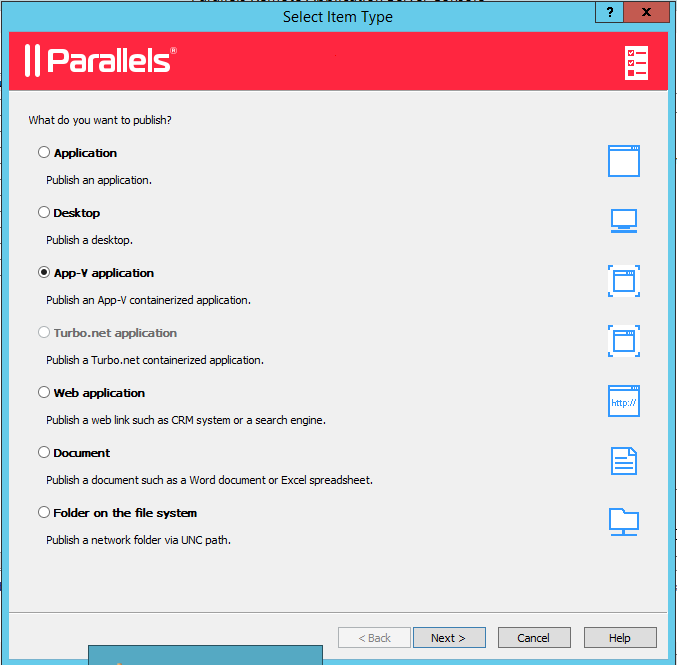 Launch the application from a Parallels RAS Client. Navigate to Parallels RAS Console> Publishing category. Click the [+] Add icon at the bottom of the right pane. This opens the publishing wizard. On the Select Item Type page, select the App-V application option. Select the server type from which to publish an application and click Next. Select a server or a group to publish from and click Next. On the Installed Applications page, select one or more App-V applications and click Next. Review the summary and complete the wizard. Once an App-V application is published, it can be launched from a Parallels RAS Client.